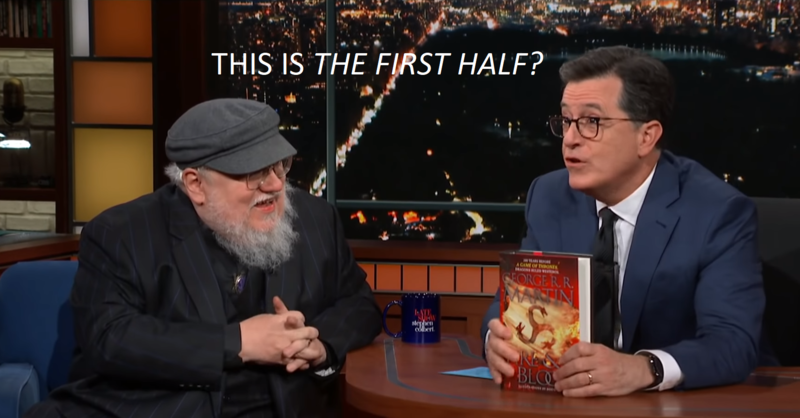 On last night’s The Late Show with Stephen Colbert, George R. R. Martin showed up to promote his latest book, Fire & Blood, which was published this week, as we just covered. Martin’s conversation with Colbert, however, quickly veers away from his fictional histories to tales of murderous turtles and their shared love of Tolkien. Take a look! When the interview gets back on track, a highlight is what appears to be Colbert’s genuine shock as he realizes that the hefty 700-page tome in his hand is only the first half of Martin’s planned Targaryen histories, followed by Martin justifying it with a sincere “there were a lot of kings!” and the audience’s enthusiastic applause. Colbert not so subtly asks him about how is it that this book even exists as he was “supposed to be finishing The Winds of Winter this entire time.” Martin doesn’t provide an answer, but he does say that, once he’s done with the sixth book, he’s at least considering the possibility of writing some more Dunk & Egg stories and/or the second half of Fire & Blood before he gets to the seventh and final book, A Dream of Spring. Considering the show will be over by then, and book readers will be happily occupied for at least a few years scrutinizing The Winds of Winter, our first new ASOIAF entry in a long time, I don’t imagine there would be as much of a backlash to that detour as there has been to the current extended waiting period—at least, I hope there wouldn’t be. This guy thinks he will live forever. The more I read about a new and a recent and a fresh and another GRRM-book, the less interest I have to read them. I’m not sweet little sixteen anymore – as he thinks he is. Okay, one man (one woman) must have plans to go on, but as some said before: there are plenty of interesting books, that already are written. I want Dunk & Egg! I don’t believe A Dream of Spring will ever be finished. But I hope he will at least finish Dunk & Egg. I’ve gotten turned onto “The Dresden Files”, so waiting for The Winds of Winter isn’t quite as bad for me. Plus, Fire & Blood has arrived! Everything as planned. Good strategy to move to the back history when he couldn’t keep ahead of the show. There was no good reason to publish during the last 3 seasons, as the competition and confusion between book and series would have been agonizing and create far too much negative energy to help either version work effectively. Far better to let D&D finish their version and in the meantime, plan narratives for future prequels. Smart man! Now that the series is ending, and his first back history is published to pique interest in the prequels (and give the prequel writers story structure), we will see him complete the next GOT book. Then, as stated, he’ll decide whether he needs to get the other backstory out or complete the final GOT book. Why do people get so irritatingly annoyed at this? Just have to realize GRRM is a classy man and wouldn’t take D&D’s fire. Same as he is crediting the woman who is writing the prequels… saying he only gave a rough outline and all the credit goes to her. This is all the most gentlemanly and lucrative pathway for all concerned. Watchers of the Show need to just get with the program and understand these choices were made for the best reasons. I get annoyed hearing the complainers…. can’t imagine how hard it is for the writers of shows and books. It’s not a choice. The reason the book hasn’t been released yet is because Martin hasn’t finished it yet. It’s clear that Martin lost control of his story and whether or not he completes the series is a question mark. That is why people are getting increasingly upset. The story that they fell in love with and have invested much of their time and money may never be completed. Sure, we still have the show’s ending, but it’s not the same thing. Happy 54th Birthday, Lord Varys!!!! Thanks for your measured, reasonable comment! I’ll buy F&B, although I’m disappointed it’s only the first half – but not right now: I’m in shortage (I guess I have spent too much lately) and I’m interested in the book, but not curious. I have bought and read TWOIAF, very enjoyable (the artwork is fantastic), so F&B can wait. If it had been TWOW, I would have tried to get my copy asap. I hope I will one day. Listening to GRRM has been fun, I like his sense of humour. there plenty of interesting books, that already written. Yes, like Fire and Blood: Part 1. It is very good and if someone is a fan of the universe they should read it, as I see no reason they won’t enjoy it. In my language we have a word for it: to let someone starve to dead at the end of a loooong arm. Sadly I don’t ever expect to see the final book, if we get Winds next year (which I remain optimistic about) and he plans to write two books before starting ADOS that’s realistically three years before he begins on it. Even in a wildly optimistic timeframe of writing ADOS in three years (more likely to be at least double that) I just cannot see it ever happening, how old is GRRM now? … how old is GRRM now? Thanks, I wish him a long life of course but you have to wonder how productive he can be at that age with so many projects on-going. This just in…the date for publishing “A Dream Of Spring” has been set ladies and gentlemen!!!! It will be 2035!!!! And George RR Martin by then existing in hologram format…will finally put out his final and exciting conclusion to “A Song Of Ice And Fire”…to compliment the classic HBO series “Game Of Thrones” whose cast will be mostly either dead, retired or middle-aged.